Where seen? 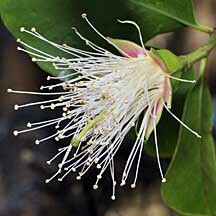 This large and beautiful tree is commonly seen, usually on the seaward side of the mangroves. It is considered the most widely distributed Sonneratia species. A pioneer species, it colonises newly formed sandy mud flats in sheltered estuaries and coastal areas. It is intolerant to long periods of exposure to freshwater. Another local name for it was 'Bedada'. Features: Tree 3-30m tall. Bark cream to light grey, finely fissured. Thick underground cable roots spread out from the trunk. These bear sturdy conical pneumatophores (25cm to 1m tall). But the tree may lack pnematophores if it grows on a solid substrate. 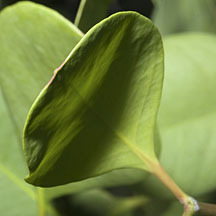 Leaves nearly circular or spoon-shaped (5-12.5cm) tapering at the base, thick and leathery. Young leaves are pale green with faint tinge of pink at the leaf 'tip'. The leaves are arranged opposite one another. Flowers large (10cm diameter) with 6 petals narrow white often inconspicuous, and many long white stamens that are pink at the base, forming a powder-puff shape. Stiff cup-shaped calyx with sepals broadly triangular and reddish on the inside. 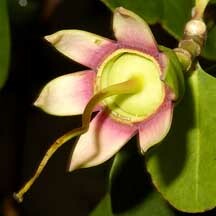 According to Giesen, the flowers are pollinated by hawk-moths, birds and fruit-eating bats. Fruit somewhat pear-shaped (5-7cm) leathery. The tips of the calyx lobes bend back towards the stalk. Seeds white, flattened, tiny, buoyant (due to air-filled tissues in the seed). See page on Sonneratia in general for more about bats, durians and these mangrove trees, as well as fireflies. Human uses: According to Burkill, it is used as firewood, but not when other trees are available. The timber is used in some places, but not valued in other places. 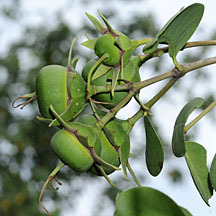 The fruits are eaten when "quite ripe" by the Malays and in Java, and used to flavour fish in the Moluccas. The leaves are also eaten raw and cooked. According to Giesen, the fruits are sour but edible. 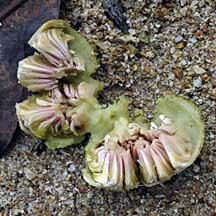 The fruits are used in a compress to check haemorrhaging. The timber is used for boats and houses in Indonesia, as well as bridge and wharf construction. Also for interior work including furniture, musical instruments but requires bronze nails. The Papuans make corks and floats out of the bouyant pneumatophores. 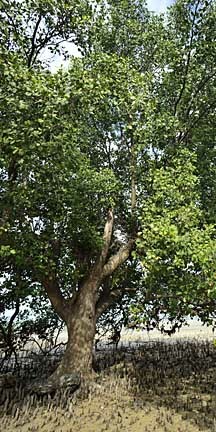 Heritage Tree: There are two Perepat trees with Heritage Tree status. They are at Pulau Ubin, near House No. 1 one with a girth of 5m and height 14m, another with a girth 4.25m and height 16m. Young leaf pale green with pink blush at tips. Calyx sepals pinkish on the inside. 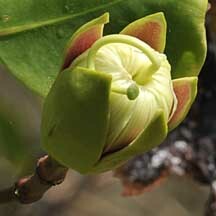 Flower just about to bloom. Opened fruit on the shore. Sonneratia alba on the NParks Flora and Fauna website: photos and fact sheet. Sonneratia alba (Myrtales: Sonneratiaceae) Mangrove Apple from Teo Xian Hui Jessica, 2013 from taxo4254. Perepat (Sonneratia alba) Ng, Peter K. L. & N. Sivasothi, 1999. A Guide to the Mangroves of Singapore I (Plant Diversity). Singapore Science Centre. 168 pp.